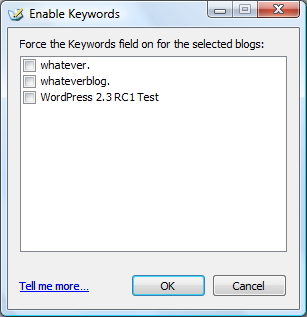 Utility: Enable keywords/tags for Windows Live Writer | whateverblog. Update [Sept. 24, 2007 – 2:28PM PDT]: This should no longer be necessary for WordPress.com, as the WordPress.com servers are now advertising keyword support via wlwmanifest.xml. (Thanks to Joseph Scott for making the change and Adam Vero for bringing it to our attention!) If you’re on WordPress.com and don’t see the Keywords field showing up in WLW yet, try restarting Writer a couple of times. This will still be necessary for custom hosted WP 2.3, but hopefully by 2.3.1 it will advertise as well. Requires .NET Framework 2.0, which you probably already have if you’re using Writer. This tool is released by me, not by Microsoft–so don’t go contacting our friendly support folks if you need help. Just fire it up, add checkmarks for your WordPress.com and WordPress 2.3 blogs, and hit OK. Restart Writer, and that should be it: if you hit F2 you should see the Keywords field in the properties panel. Note #2: What’s the difference between “keywords” and “tags”? Beats me. For the purposes of this post, they’re synonymous, except that WLW calls them keywords and WP calls them tags. Joe, thanks for that tool, which should make it easier for people to make the change. This adds the registry value under ManifestOptions rather than UserOptionOverrides, which makes sense as it is “official” rather than a workaround. The zip file includes a wlwmanifest.xml file and some images. Unzip it in your WordPress directory and that is it. Unfortunately I didn’t get this in time for 2.3, but I expect it to go in for future releases. Thanks for pointing me to your blog, and this post. This will make using WLW even better, after I get my blog updated. Guess I can do that right now. Nice! I do wish though that title tags had support too.. I am using the latest LiveWriter and have upgraded my blog to use 2.3.1. Any idea why LW doesn’t have the keywords field? Brilliant. Great job, I can now use my wp install with tags. I had very high regard for live writer already…and now this plugin of yours has given a cult status to WLW. What else can i expect from a software developer at Microsoft on the Windows Live Writer team…?